In short, a contract is an express agreement in which the parties choose the terms of their relationship. In effect, they write private law which will govern their relationship. 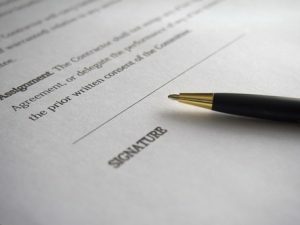 Contracts can be enforced in court – indeed, the enforceability of contracts is one of the major underpinnings of the United States economy. Contracts can be written or oral. Both are enforceable if they meet the requirements for a valid contract. The main problem with oral contracts, however, is evidence – it is more difficult to prove the existence and terms of an oral contract. Promissory Estoppel. Courts have ruled that to establish promissory estoppel, a party must prove that: (1) there was a clear and definite promise from the party receiving the benefit; (2) the promise was made with the expectation that the conferring the benefit would rely on it; (3) the party conferring the benefit (and receiving the promise) did, in fact, rely on the promise; and (4) there was identifiable loss as a result of that reliance on the promise. The difference between fraud and promissory estoppel is that in fraud there must be an intent to deceive, which is not required for promissory esoppel under New Jersey contract law. Quantum Meruit. In quantum meruit, a court may find that the parties’ relationship is sufficiently like a contract for the law to assume that there was an implied agreement which is enforceable under New Jersey contract law. To recover under quantum meruit: (1) a party must have preformed services in good faith; (2) the services must have been voluntarily accepted by the person for whom they were rendered; (3) the person performing the services must have reasonably expected payment for performing the services; and (4) the amount charged for the services is reasonable. Unjust Enrichment. Unjust enrichment is like quantum meruit, but essentially from a different angle. It is based on society’s interest in preventing someone from retaining a benefit without compensating the party which conferred the benefit. To recover under unjust enrichment: (1) one party must have received a benefit from the other; (2) allowing the receiving party to receive the benefit without compensation would be unjust; (3) the party conferring the benefit expected to be compensated when it conferred the benefit; and (4) the receiving party would be unjustly enriched beyond its contractual rights if it did not have to pay for the benefit. The most desirable agreement to have is a written contract. With a written contract everyone knows what the terms of the relationship are, and it is more readily enforceable in court. However, in the absence of a written contract, there are still ways to enforce an agreement and for people and businesses to enforce their rights – oral contracts will be enforced, and quasi-contractual remedies offer another means of recovery. However, the key in all of these is evidence. The more representations and concurrence that can be established in writing the more likely a court will enforce your writes – so document everything and save everything! And if possible, always get a written contract! Our business attorneys help people and businesses negotiate and draft enforceable contracts which protect our clients’ rights. When deals go south, our litigators will fight for our clients’ rights in New Jersey state and federal court, arbitration and mediation. Call us at (973) 890-0004 or email us to schedule a consultation.